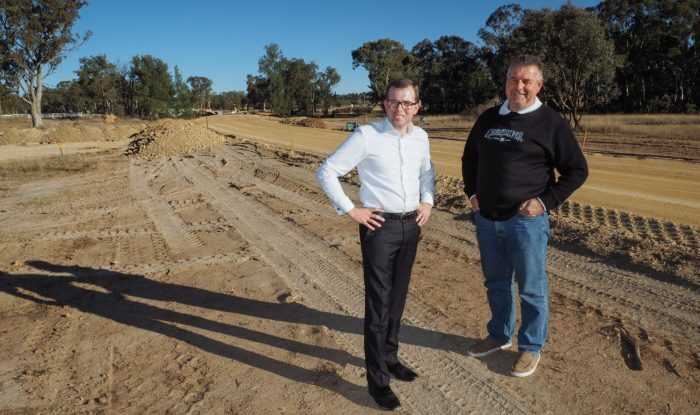 ONE of the biggest bottlenecks on for motorists and heavy vehicle freight travelling between Inverell, Uralla and Armidale on Thunderbolts Way, Abington Creek Bridge, is a few weeks away from being completely renewed. The old single-lane, timber-decked bridge is being replaced with a new $1.45 million 45-metre long, dual-lane concrete bridge that has been realigned to take the acute bend out of the road forced by the position of the old bridge. Northern Tablelands MP Adam Marshall and Uralla Shire Mayor Mick Pearce inspected the final stages of the new bridge’s construction this week. The new bridge structure was completed months ago and now Uralla Shire Council work crews are busy completing the road approaches on both sides, on a new alignment. “By replacing this bridge and building a new one – we are helping ensure freight movements in and out of town centres such as Armidale and Inverell are safe, efficient and timely,” Mr Marshall said. The new bridge, midway between Uralla and Bundarra, is scheduled to be opened later this month. The NSW Government has provided $705,000 for the new bridge through its Fixing Country Roads program. The state government is jointly funding the $1.45 million project with the Federal Government and Uralla Shire Council. Fixing Country Roads is one of the NSW Government’s flagship programs for the bush, providing funds to help councils repair local roads and bridges and improve regional road and freight pinch points in country NSW.